Last month, in an attempt to prove their claims that Bing is just as good as Google, Microsoft launched the “Bing It On” campaign. Structured much like the “Pepsi Challenge” series of ads that ran in the 70’s, the Bing It On campaign allows users to perform a side-by-side comparison of the two search engines’ organic search results through a specially designed web page. To learn firsthand what people thought about the Challenge and Bing, we asked our independent research partner, Answers Research, to field a survey* with approximately 4,700 people. We asked for people’s impressions of Bing before taking the Challenge and then after they completed it. What we found was 64% of people were surprised by the quality of Bing’s web search results. Over half of the people surveyed indicated their impression of Bing improved after seeing Bing’s web search results next to Google’s. Additionally, of people who identified Google as their primary search engine, 33% said they would use Bing more often after taking the Challenge and 17% who found Bing more favorable after taking the side-by-side comparison said it revealed flaws in Google’s results. This is surprising news considering that not too long ago Bing was doing rather poorly compared to Google. And although Bing’s market share is at an all-time high, placing it second after Google, they still have quite a ways to go before they can break users’ “Google habit”. 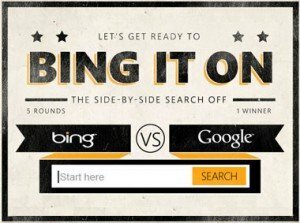 The Bing It On campaign was marketed aggressively through various television channels on prime time TV, as well as at events like the MTV VMA Awards.